Italian Studies was founded in 1937 as the annual journal of the Society for Italian Studies (SIS), and has established itself nationally and internationally as one of the leading journals in the discipline. 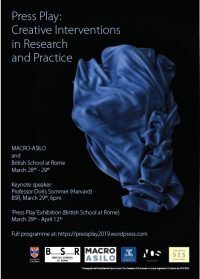 The journal has contributed to the development and broadening of Italian Studies as a field of enquiry within the Arts and Humanities, and has itself expanded in 2005 to two issues, in 2010 to three issues, and in 2015 to four issues per year. The editors welcome original scholarly and critical work, in English or Italian, on Italy’s literary culture, and also work on Italy from a range of other disciplines and inter-disciplinary fields, including history, politics, linguistics, art history, film, gender and cultural studies. Articles which adopt a comparative or global perspective on Italy are encouraged alongside those whose focus is exclusively the Italian peninsula and islands. Each issue includes a reviews section, and usually a review article, which encompass a similarly broad spectrum of the most recent Italian-related publications. Interviews with scholars, writers and creative practitioners are often featured. The first (February) and second (May) issues of the journal each year are the general issues, including articles of critical enquiry into Italian literature, film, art, history, language, and critical theory from the thirteenth century to the twenty-first. The third (August) is normally a themed issue, and may appear as a guest-edited Special Issue, where a suitably developed topic and body of material have been proposed. The fourth (November) is the Cultural Studies issue, dedicated to articles addressing aspects of Italian culture, again from medieval times to the present day, using materials and modes of enquiry which extend the methodological scope of the discipline. Catherine Keen (UCL), General and Special issues, submissions on material pre-1750.